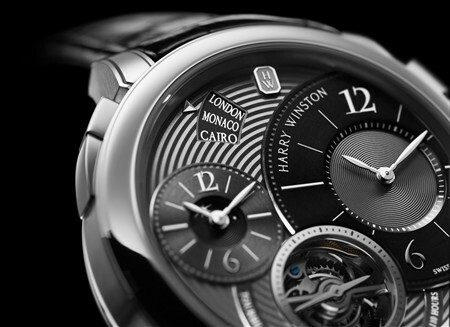 Harry Winston brings its urbane and sophisticated spirit to the forefront with the Midnight GMT Tourbillon, the brand’s creation for the Only Watch Charity Auction 2011. 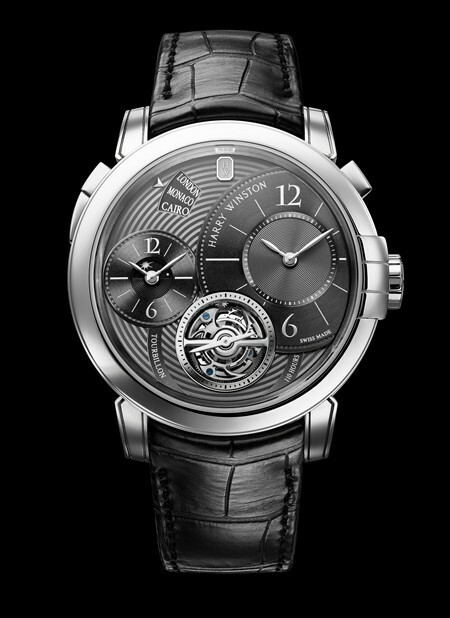 An exclusive model from the Midnight Collection, the Midnight GMT Tourbillon finely balances technical accomplishment with aesthetic refinement. The mechanical automatic movement – contained by a svelte but powerful platinum 45mm case – is endowed with a 110-hour power reserve. While the tourbillon at 6 o’clock displays the small seconds, the GMT display at 9 o’clock is enriched with a day/night indication. The second time zone is revealed by way of an aperture at 11 o’clock; Monaco is included as a tribute to Only Watch. The aesthetic appeal is topped off by the ruthenium dial and bezel, the latter bearing the three distinctive arches of Harry Winston’s New York salon at 3 o’clock.